What kind of tacos are right for the season? Pumpkin tacos! 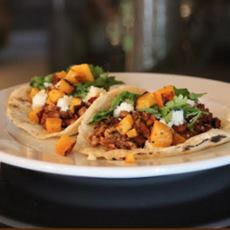 Or at least, butternut squash tacos. Pumpkins and all other squash species originated in Central America more than 7,500 years ago. The oldest domesticated pumpkin seeds found to date are from the Oaxaca Highlands in southwest Mexico. 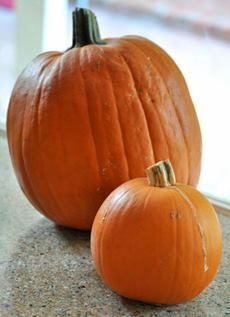 The original pumpkins bore little resemblance to today’s large, bright orange, sweet variety. They were small and bitter. Domestication and breeding produced the pumpkins we know today. Brought to North America, pumpkins were a welcome food for the winter. Their thick skin and solid flesh were ideal for storing and consumption during months of scarcity. The Pilgrims (1620) and other Europeans immigrating to America were introduced to pumpkin by Native Americans. The first known pumpkin recipe they made was found in a book from the early 1670s: a side dish made from diced pumpkin, cooked down and blended with butter and spices (as acorn squash, butternut squash and sweet potatoes are prepared today). During the 17th century, housewives developed an inventory of pumpkin recipes, the most popular of which remains [drum roll…] pumpkin pie. In the 1800s it became stylish to serve sweetened pumpkin dishes during holiday dinners. The first proclamation for “national days of prayer, humiliation, and thanksgiving” led to an observance on November 28, 1782. Since 1863, Thanksgiving has been an official annual holiday, by proclamation of President Abraham Lincoln. This recipe was sent to us from Gilt City, which teamed up with Santa Monica-based Taco Teca to create something new for National Taco Day (October 4th). We’ve slightly adapted the recipe. 1. HEAT grill on medium/high heat for 10 minutes prior to grilling. Preheat the oven to 425°F. Seasonal tacos: chicken with pumpkin or butternut squash. A sugar pumpkin and a jack-o-lantern (photo courtesy Baking Bites). Arbol chiles (photo courtesy Rancho Gordo). 3. CHOP the butternut squash into cubes and place them on a roasting tray. Place in the oven and roast until golden brown, about 20 minutes. 4. CHOP the cooked chicken into bite-size pieces and place them in a saute pan with the salsa. Simmer for 10 minutes. 5. REMOVE the chicken from the saute pan directly onto the center of the tortilla. Top with the butternut squash and queso fresco and garnish with cilantro. Serve with a side of cranberry sauce and a pumpkin ale. This recipe is from Mexican-Authentic-Recipes.com. Mulatto salsa takes just 5 minutes to make. 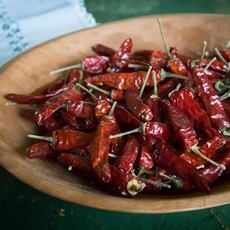 It is quite hot because it is prepared with arbol chiles. If you’d like less heat, use an equivalent weight of aji amarillo or serrano chiles. Check out the heat levels of different chiles on the Scoville Scale. The texture of the mulatto salsa is soft and oily, unlike the condiment salsas most Americans know. 1. PLACE the chiles on a griddle over medium heat and roast for about 40 seconds, turning regularly, until all sides are lightly roasted. Transfer to a blender. 2. ADD the garlic, oil and salt. Blend well.